Means low towing resistance for excellent miles per gallon on long hauls. 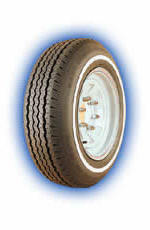 Flexible radial sidewalls provide a smooth, soft ride to help protect precious cargo. High on durability and long on mileage, rubber chemistry also accounts for cool-running performance.